Few pieces of hardware have garnered as much attention this year as Samsung’s 850 EVO solid state drive. 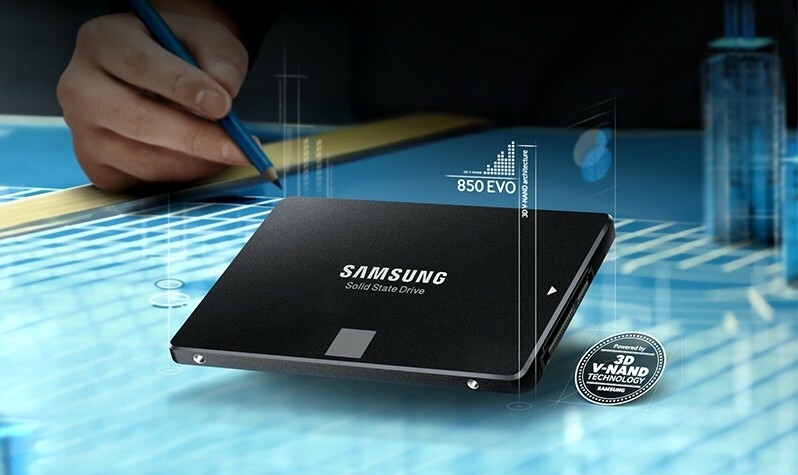 Over the summer, Samsung announced it was developing a TLC version of its 3D V-NAND that was destined for the 850 EVO. More details emerged as we entered the fall and once the modules entered mass production in October, enthusiasts knew the 850 EVO’s launch was imminent. While not as fast or durable as its 2-bit counterpart, 3-bit flash is able to mitigate some of its shortcomings thanks to its TurboWrite caching technology as well as the 3D architecture. As such, drives carrying the new chips are still very fast and quite durable. Available in capacities of 120GB, 250GB, 500GB and 1TB, the 850 EVO touts sequential read speeds of up to 540MB/sec and writes at up to 520MB/sec. Random 4K IOPS check in at 90K when utilizing TurboWrite. All drives carry a five year warranty and as an example of their endurance, Samsung tells us that the 500GB and 1TB models can withstand 80GB of data writes each day during this five-year period. This should be more than enough for most consumer workloads. Samsung’s MSRP for the drive is set at $100, $150, $270 and $500 for the 120GB, 250GB, 500GB and 1TB drives, respectively. No word yet on when they’ll actually go on sale, however. Looking ahead, Samsung is planning to expand the 850 EVO line-up next year with mSATA and M.2 form factors.